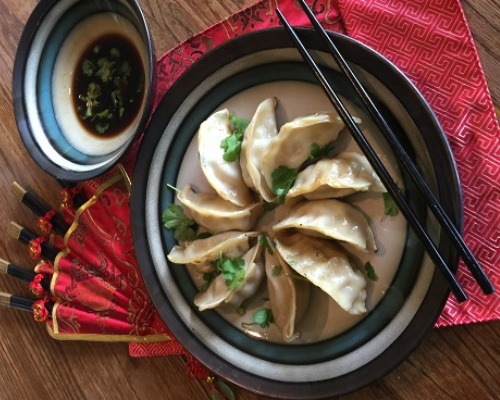 Ayusa student Kai shares his family’s multicultural roots with his host family by cooking jiaozi dumpling. I love to cook dishes for my host family, especially Chinese food which always reminds me of home...It is a great experience to share a part of my culture with them. My name is Kai Chen. I am an exchange student from Germany and currently resident in Idaho, USA. My parents are Chinese but they moved to Germany over twenty years ago, so I was born and raised in Germany. Growing up with two different cultures and languages was a huge blessing to me. I have always been interested in learning about other people, languages and cultures and the food is a big part of a country's cultural life. When I am at home I usually eat Chinese food, but when I am eating outside with friends or in my school's cafeteria, it is usually German food. I love the variety and I enjoy trying out new food every time I can. Both of my parents are very passionate about food as well. They've had several different Chinese restaurants over the years and I was able to learn a lot from them about cooking. I love to cook dishes for my host family, especially Chinese food which always reminds me of home. The Chinese cuisine is exotic and diverse with many rich flavors and spices. My host family is amazed by the authentic Chinese food and how different it is from the American-Chinese fast food. It is a great experience to share a part of my culture with them. One of the most important holidays in our Chinese culture is the Chinese Lunar New Year. It is celebrated on the first day of the new year according to the Lunar Calendar. The day is very colorful, exciting and festive. All family members come together to exchange presents, to talk and, of course, to eat lots of good food. Since I wasn't able to celebrate the Chinese New Year with my family this year, I definitely wanted to share that tradition with my host family. I prepared the famous Chinese dumplings, called jiaozi or pot stickers for us. Jiaozis are symbolic for luck and prosperity and that's why you would always see them on a Chinese New Year feast. Plus, they taste absolutely delicious. What I love about making jiaozi dumplings is that you can customize the fillings and use pork, beef, chicken, shrimps and your favorite kind of veggies. So many ingredients are possible. This recipe is from my dad and is one of my favorite foods. It is also very easy to make, but time consuming, if it's made from scratch. That's why the whole family usually helps to make them. Add water to the flour and combine it. Knead it with your hands until it becomes a soft, smooth dough. Let it rest for at least an hour. Mix all the ingredients for the filling together. Place the wrappers on a work surface. Spoon 1 tablespoon of the filling into the center of each wrapper. Fold the dough over to create a half-moon shape and pinch the edges to seal. Heat a little bit of oil in a flat pan over medium heat. Add jiaozis in a single layer and cook until it becomes golden brown and crispy on the bottom (around 3 minutes). Then add about 1/3 cup of water to the jiaozis, put a lid on and let it steam for a couple more minutes. Serve with soy sauce and vinegar.